The installation process of a sprinkler system is one that has always acquired a number of common misconceptions. Many customers are surprised at how minimal the disruption of their property is upon completion. This is because Fisher Irrigation Systems prides itself on the cleanliness of our work ethics. Our installation crews devote a portion of each day on a site to a cleanup process that aides in the overall satisfaction of the customer. The process of having a sprinkler system installed at your residence can be broken down into two phases. Next comes the installation of the irrigation timer, which is generally placed in a location that is easily accessible by the homeowner and irrigation technicians, while being in an area that will not disrupt daily activities or take away from the aesthetics of your home. Finally, we carefully select a location for the wireless rain sensor. The sensor will determine when there has been enough rain fall and automatically shut down the irrigation system until things dry out and additional watering is required. Beginning at the point of connection established in phase one, this process is where the underground pipes and irrigation valves are installed. At the point of connection, an emergency outside shutoff is installed for peace of mind. An underground pipe pulling machine is used to put these pipes in place by connecting the pipe to a blade that is lowered into the ground. This blade pulls the pipe with ease through the ground, leaving only a small slit on the surface. Once these pipes have been successfully placed underground, the machine then drives over the area to close the slit back up. The PVC pipe is generally installed at a depth of 10-12 inches, which assists in protecting the irrigation lines from routine maintenance and activities around your property. More delicate areas such as flower beds are completed by hand in order to avoid any disruption of shrubs and flowers. After all of the PVC pipe has been successfully installed, the sprinkler heads are connected and separated into sections by valves called zones. These sprinklers are placed throughout the property to maximize the most efficient watering layouts that ensure every inch is properly covered. 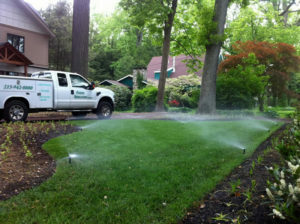 Once completed, the irrigation system is tested multiple times, and all heads are adjusted to proper watering coverage. The installation process is complete once a final walk through and inspection is conducted with the homeowners and a representative from Fisher Irrigation Systems.